Over the coming months and years, we will continue to listen and learn more about the community to ensure that this project is a win for all Virginians. We are excited to be an even bigger part of the community with the establishment of our new headquarters in National Landing. We will add 25,000 new jobs to the more than 10,000 employees we already have in the Virginia and DC metro area. The ability to attract world-class talent that will allow us to continue investing on behalf of customers for years to come was the leading driver of our decision to locate in Northern Virginia. The Commonwealth’s tech talent pipeline initiative will make Virginia even more competitive and will benefit existing employers and attract business across the Commonwealth. 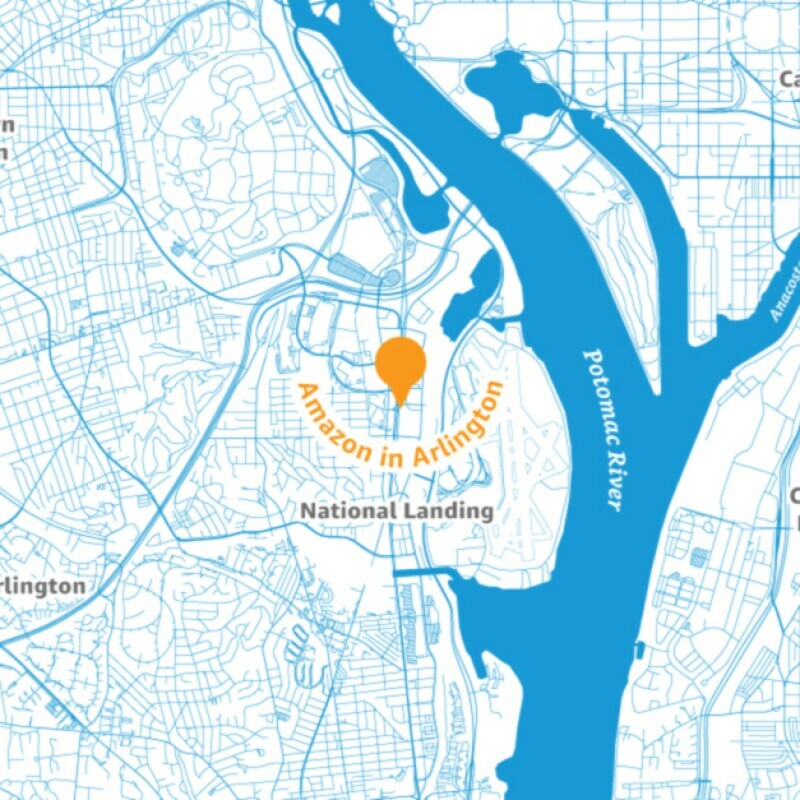 National Landing encompasses Crystal City, other parts of Arlington, Alexandria, and Potomac Yard. Amazon is no stranger to Virginia - we already know it is a great place to live and work. What type of jobs will be located in National Landing? What Amazon businesses will be there? Our new headquarters in Virginia will help us manage our future job creation across all businesses. New businesses and existing businesses that can operate in multiple locations will lead growth at our new headquarters. We intended to have those businesses develop organically and we did not have specific business units in mind for moving here. We expect 50% of the jobs to be tech related and the remainder fulfilling typical corporate support roles in areas such as legal, accounting, HR and more. When will you start hiring? How many people do you plan to hire this year? 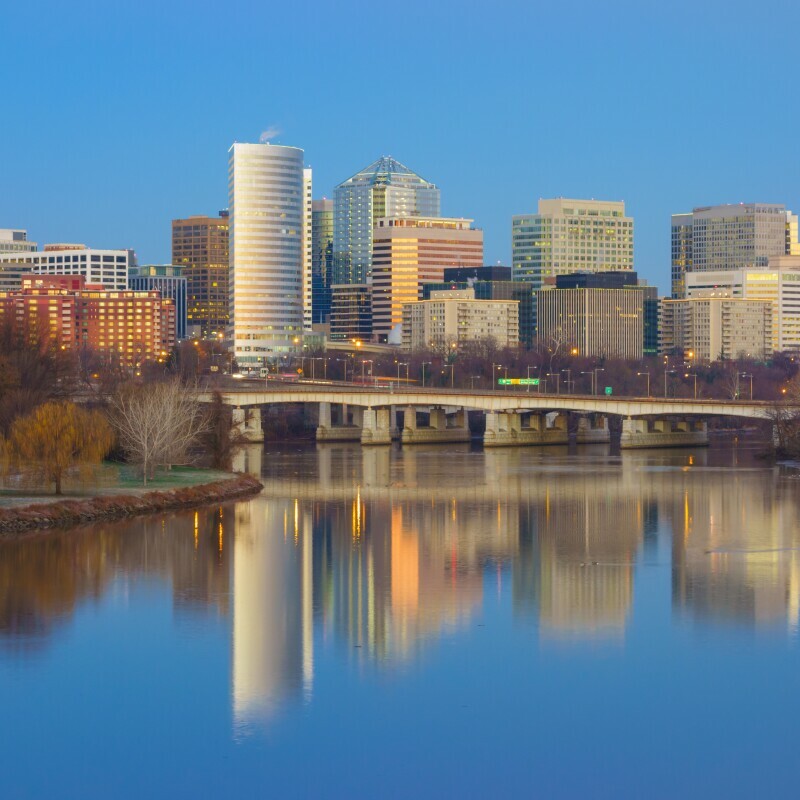 We’re excited to begin hiring for our headquarters in Arlington later this year. It will be a gradual process, with approximately 400 employees expected in 2019 and approximately 1,000 – 1,500 employees per year in subsequent years. We will communicate regularly with the County and the Commonwealth about our plans. What benefits does Amazon offer its employees? We offer comprehensive benefits that support employees and eligible family members, including domestic partners and their children. These include medical, dental and vision coverage, a 401k savings plan, paid time off and company paid basic Life, Accidental Death, and short- and long-term disability insurance. We also offer a range of fully paid maternity and parental leave options for parents prior to, during and following the birth or adoption of their child. This includes our “Leave Share” program, which allows Amazonians to share their parental leave with their spouse if he or she is not eligible for paid parental leave at their place of work. All employees – whether they work in our fulfillment centers or they are senior executives – get the same benefits starting on day one of employment. What is Amazon’s commitment to diversity? Diversity and inclusion were included as an area of importance in our RFP for this project and it is part of the reason we chose Northern Virginia for our second headquarters. We honor and respect the differences inherent in each Amazonian, and we seek to include those perspectives as we develop new products and services for our customers around the world. We also strive to create a sense of community among employees of various backgrounds in order to foster engagement and innovation. For example, our Affinity Groups bring employees together across businesses and geographies. With executive and company sponsorship, these groups play an important role in building internal networks for career development, advising Amazon business units, leading in service projects, participating in policy discussions and reaching out to communities where Amazonians live and work. For more on our commitment to diversity and other initiatives, please visit: https://www.amazon.com/diversity. Will you build your new headquarters with a commitment to sustainability? Our buildings in Seattle are sustainable and energy-efficient. The buildings' interiors feature salvaged and locally sourced woods, energy-efficient lighting and composting and recycling alternatives, as well as public plazas and pockets of open green space outside of the buildings. Twenty of the buildings in our Seattle campus were built using LEED standards. We also use innovative recycled heating in many of the buildings. This is not our ceiling, but our floor for our new headquarters – we expect to meet and improve upon the standards we’ve set for ourselves in Seattle. Did Amazon select Northern Virginia because it wants to be close to the federal government? No. Our decision was based on the criteria outlined in the RFP, with attraction of top talent being the primary driver for selecting Northern Virginia. Moreover, Amazon has agreed to a reduction in the incentives we receive if more than 10% of the new jobs we create are primarily engaged in supporting federal government contracts. How will Amazon engage with the community? At Amazon, we are committed to ensuring all children and young adults, especially those from underrepresented and underprivileged communities who live near our physical locations, have the resources and skills they need to build their best and brightest futures. We focus on building long-term and innovative programs that will have a lasting, positive impact in communities around the world. Amazon is also committed to what we call “Right Now Needs,” which includes increasing access to food, shelter, and basic goods for children and their families, specifically when it comes to fighting hunger, homelessness, and disaster relief efforts. In Arlington, we have been meeting with community leaders, elected officials, non-profits, small businesses and others to seek their input as we develop additional programs specific to this location and determine where best to invest our resources. For more information about Amazon in the community, please visit: https://www.aboutamazon.com/our-communities/amazon-in-the-community. What does the new headquarters mean for small- and medium-sized businesses in the area? Bringing new employees to work in Arlington means a significantly larger customer base for all the local businesses. In Seattle, for example, we offer limited food service in our buildings to purposely push employees out into the neighborhood where they buy lunch and shop – injecting their dollars into the local economy. We also have first floor retail in most of our businesses where we host locally-owned businesses instead of national chains. According to the Downtown Seattle Association, more than 2,000 small businesses have opened in downtown Seattle since Amazon moved to South Lake Union. In addition, half of the items sold on Amazon worldwide are from small and medium-sized businesses. We help these businesses reach millions of customers worldwide by opening our virtual shelf space so they can sell right next to Amazon. They are no longer limited by their physical geographic locations and the costs of driving customer traffic to their branded websites. For more on how Amazon’s urban campus revitalized a Seattle neighborhood, please visit: https://blog.aboutamazon.com/job-creation-and-investment/catalyst-for-growth. Will the new headquarters in Arlington affect my commute? One of the key drivers in our decision to come to Northern Virginia was the availability of a good public transit system. Today, more than 50% of Amazon’s Seattle employees use public transportation, walk or bike to work – and we expect this same pattern for our new HQ location. Further, the bus and Metro lines that currently go to National Landing are underutilized. The establishment of our headquarters will not require new routes or modes of transportation and will not overcrowd the system. Our MOU includes additional investments in the transportation infrastructure that will benefit both Amazon employees and the community overall. Where can I read the agreements associated with this project? Click here to read our Memorandum of Understanding with the Commonwealth of Virginia. Click here to read a letter on the proposal from Arlington County. More information from Arlington County is available at: https://www.arlingtonva.us/amazon/. Where should I look for information about Amazon unrelated to this project? Click here for Amazon information outside the scope of this project.